White erase board surface can be written on with neon dry/wet erase or liquid chalk markers. 6-12 Sections for writing in fun and exciting prizes. Silver aluminum stand is 35-3/4" tall for a tabletop display. Casino-like clicking noise from the plastic flapper and pegged board to build excitement when spinning. 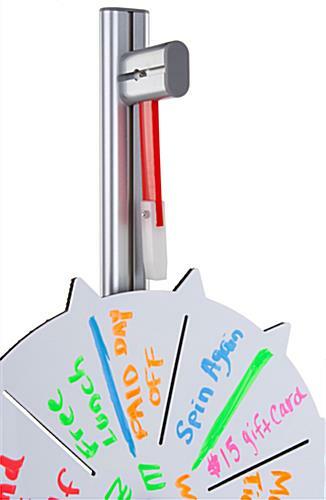 This tabletop prize wheel, also known as a award spinner, is easy to update with the wet erase surface. This custom promotional spin display provides an ideal motivational activity for offices to provide some fun and increase employee morale! 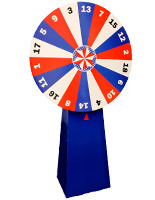 This prize wheel that is 19" in diameter is the perfect size for a tabletop display. 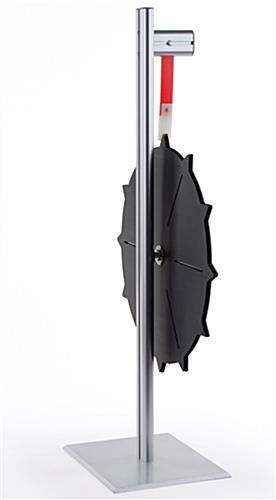 This spin to win stand is ideal for offices, classrooms, stores, and more! 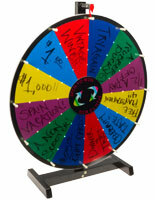 This prize wheel that has 6-12 write on sections can be updated instantly with any wet erase or liquid chalk markers. 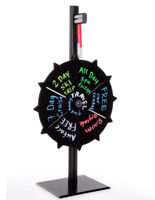 This custom spin game is fun to play and creates a casino-like clicking noise when spinning to draw attention! This prize wheel is fun and exciting. This promotional display is sure to attract attention. 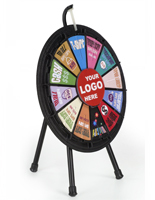 This clicking display, prize wheel that includes a tabletop stand is silver and sleek to fit into any environment. This erasable white board can be updated with new awards after every play to provide ever changing giveaways. 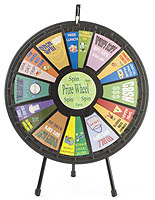 This prize wheel makes a clicking noise with the plastic flapper to create a buzz when in use. The aluminum pole and stand have a silver finish and stands on a tabletop. 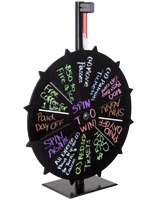 This spinning prize wheel makes awarding prizes fun and exciting! This fortune display is perfect for increasing involvement within an office or increasing customer excitement at a retail store. 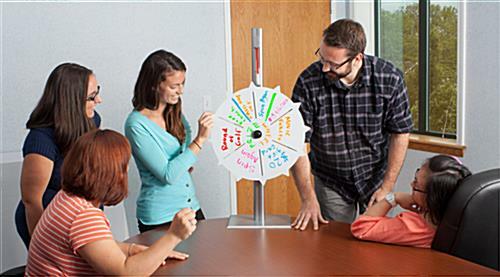 This prize wheel is meant for use with wet-erase markers. Customer Please Note: This prize game is designed for use with the wet-erase markers or liquid chalk markers. 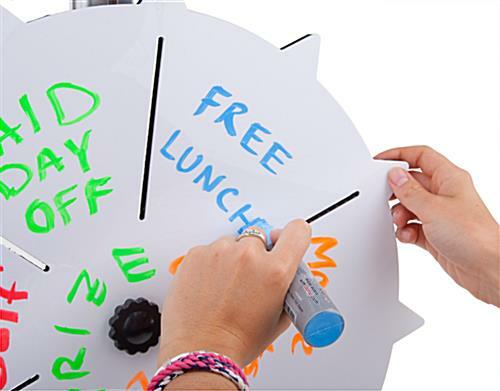 We do not recommend the use of dry erase markers, as these may leave "ghosting" on your prize wheel. 32.0" x 35.8" x 9.8"